Salt works amazingly well as a stain remover if the stain is from spilled liquid and the spill is recent. 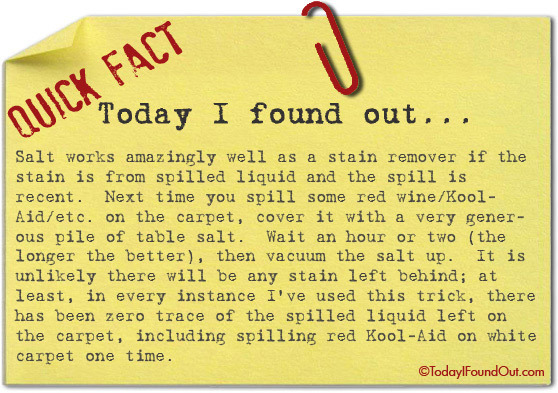 Next time you spill some red wine/Kool-Aid/etc. on the carpet, cover it with a very generous pile of table salt. Wait an hour or two (the longer the better), then vacuum the salt up. It is unlikely there will be any stain left behind; at least, in every instance I’ve used this trick, there has been zero trace of the spilled liquid left on the carpet, including spilling red Kool-Aid on white carpet one time.